Spread all the vegetables in a baking tray. Sprinkle with EVOO, salt, and pepper. Broil at Low for 15 min. Enjoy just half a plate of this and other half fill with any salad of your choice. Share with family and friends. Save some for next day lunch!! 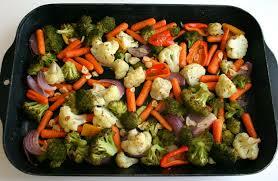 You can also stir fry all these veggies or any veggies of your choice in a large pan.